The Bowie Baysox and several community partners were able to help 11 families, including 35 kids, through Louie’s Holiday Hope Project this year. The team worked with Prince George’s County Fire/EMS Department, Bowie Youth & Family Services, Lloyd And Associates Real Estate Group and the Bowie Police Department to help more than twice as many families as last year. Nine of the families helped through the project were from Bowie and the other families were from Pasadena, Md., and Manchester, Md. 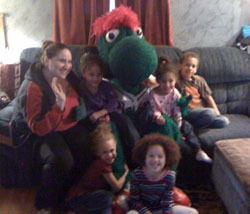 The Baysox and their lovable mascot Louie donated food and toys to the families. 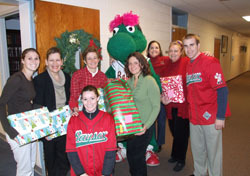 This holiday season was the third time the Baysox facilitated the program. Last year, the Baysox and their partners were able to help five families with food, toys and winter coats. The team intends to bring the project back in 2010 and looks forward to working with their community partners. Louie loves helping his friends through Louie's Holiday Hope Project. Louie and members of the Baysox took a picture with their friends from Bowie Youth & Family Services.